St John Bosco School pupils have been nominated for a Best of Wearside Award. A Sunderland school which has supported a nun’s mission to help those in need has been recognised for its efforts with an nomination in this year’s Best of Wearside Awards. St John Bosco School has been put forward for the Community Champion accolade in the Echo’s annual awards. St John Bosco School pupils with the Christmas gifts they have donated. The school, in Bradford Avenue, was nominated by Sister Scholastica for helping her down the years. Sister Scholastica founded The Stella Maris Centre - in the name of the Apostleship of the Sea - a Catholic charity aiming to provide practical and pastoral support to seafarers of all faiths. 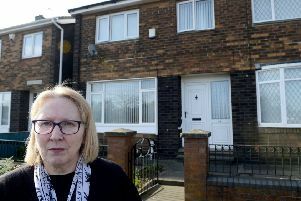 She runs the drop-in facility which is owned by Sunderland City Council and the Port of Sunderland, where it is based. The school has been supporting Sister Scholastica’s work since 2010. On the nomination, Sister Scholastica said the school was one of many groups and organisations that has helped her over the years, and thanked them all. She said: “They, for me, represent the Sunderland citizens, Sunderland Port Community, Our Lady Queen of Peace Parish,the Blue Watch, and the many organizations who have made Sunderland Seamen’s mission a success story. “The school involvement has been over many years, starting first by supporting me with the homeless project called Streetcare. “When the school discovered I had taken on the hard task of setting up a Mission for Seamen within Sunderland port they offered their encouragement and dedicated support. “Staff, children, their parents, and the parish have been involved in getting the funding to buy the most needed items for the seamen. Sister Scholastica said staff at the school also donated £200 towards helping seamen at the Port over Christmas stay in contact with their families via internet. In 2016 and 2017 the children also visited the Stella Maris Centre at Christmas time and brought gifts for those less fortunate. The school’s head teacher, Lianne Peart, said: “The children of St John Bosco RC Primary School have supported Sister Scholastica in her mission since 2010 through fundraising and in doing so strengthening links between our school, the parish and the local community. “The children enjoy working alongside Sister Scholastica, sharing in her desire to help those in need. “Working alongside such a role model has inspired the school council to organise lots of other fundraising events including odd socks day, Children in Need and the Macmillan Coffee Morning. “They also presented Christmas gifts to Wearside Women in Need in December. This year’s Best of Wearside Awards has backing from headline sponsor BGL Group, partner sponsor Gentoo and category sponsors Stagecoach and Calsonic Kansei.